at the Rabenes Farm in Guatemala. Mouse over image for lager view. They actually took the time and energy to print brochures for each member of the group, personalized with our names and company information. 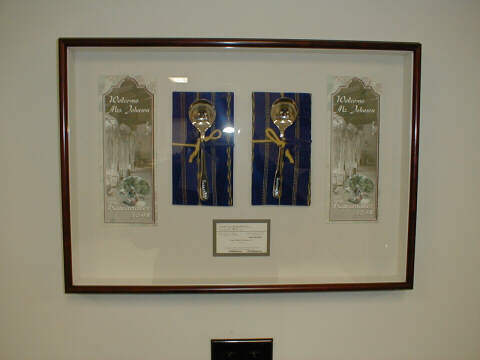 I shall always cherish these and hence they are framed in this shadow box in our tasting room. We hold daily "sip and spit", pardon the affectionate use of this term. Actually it is a Coffee Tasting. The plant shuts down every day for 15 minutes as we take part in a tasting session. I want everyone who works in the business to know what all the products taste like. So we sit, and spit. Although to be truthful, not a lady in the crowd actually spits. They are too polite and we are only tasting a single origin or two. If you were tasting a bunch, then you definitely would expel the coffee. I have been in tasting rooms where I did not and, whew, by the end you are charged.